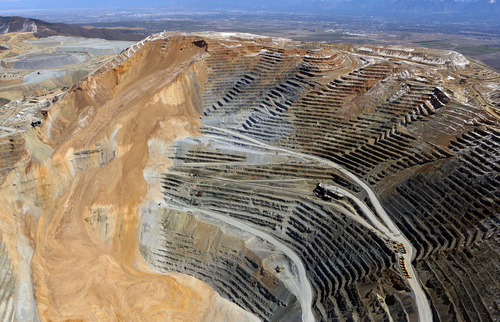 Bingham Canyon • Company says more than 165 million tons of rock tumbled to the mine floor. Francisco Kjolseth | Tribune file photo An April 10 landslide sent about 165 million tons of rock crashing down into the Bingham Canyon Mine. Kennecott has said the slide will reduce its production by 50 percent this year and on Thursday announced it will force layoffs later this month. The mine employs about 2,100 people. 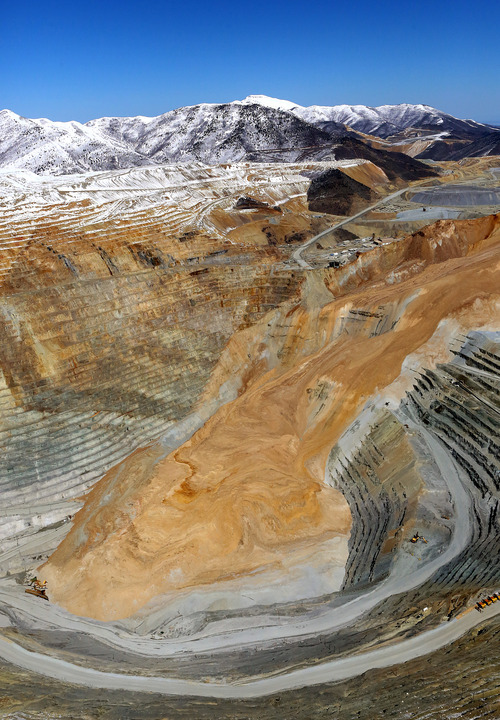 The slide hit Kennecott's open-pit copper mine about a week ago along the northeast wall. Photo courtesy of Rio Tinto-Kennecott Copper Francisco Kjolseth | The Salt Lake Tribune The landslide area at Kennecott is seen in this photo from Thursday, April 18, 2013. Francisco Kjolseth | Tribune file photo An April 10 landslide sent about 165 million tons of rock crashing down into the Bingham Canyon Mine. Kennecott has said the slide will reduce its production by 50 percent this year and on Thursday announced it will force layoffs later this month. The mine employs about 2,100 people. Tribune file photo Since opening in 1992, the visitors center has hosted more than 3 million visitors. The fees collected, along with donations from Kennecott employees and the Bingham Canyon Lion's Club Gift Shop, are donated to local charities. The slide that took down a corner of Kennecott&apos;s Bingham Canyon Mine just might land in the record books. Landslide experts say last month&apos;s rock avalanche at the copper mine has all the signs of being North America&apos;s biggest one to date, not counting ones that happened before records were kept or those tied to volcanoes. "It&apos;s so big," said Jeff Moore, the University of Utah geologic engineer behind the estimate, "it&apos;s hard to sense and feel." "We haven&apos;t had something of this magnitude since [Montana&apos;s] Earthquake Lake" in 1959. Moore&apos;s assessment is based on fact sheets Kennecott Utah Copper released shortly after the April 10 slide, when the company announced "more than 165 million tons" had tumbled from the century-old mine&apos;s northeastern section and sloughed to the mine floor six-tenths of a mile down. By Moore&apos;s estimate, that&apos;s around 85 million to 92 million cubic yards of rock and dirt, along with traces of the copper, gold, silver and molybdenum that&apos;s been mined from the pit for more than a century. That makes the slide bigger than the one that inundated Thistle in Utah County in 1983. That landslide, of natural causes, amounted to around 28 million cubic yards and destroyed Thistle, causing about $400 million damage. The volume of material that fell from the side of Bingham Canyon on April 10 would fill 21 Great Pyramids of Giza, and spread out over New York City&apos;s Central Park, it would be 65 feet deep, Moore estimates. And the epic Quake Lake slide in Montana? 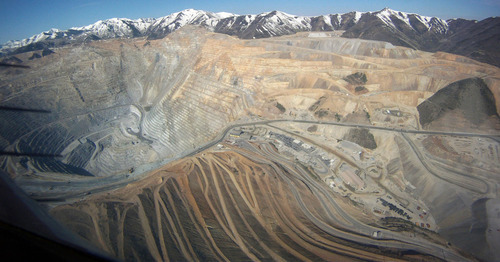 That earthquake-triggered landslide amounted to less than half the size of Kennecott&apos;s at 36 million to 43 million cubic yards. Notably, even though Quake Lake was smaller in volume, its impact was felt in terms of loss of life. The quake and slide killed 28 people. In the Kennecott slide, mine operators cleared people and most equipment out of the pit before any harm could come to them. The smart preparation meant damage to shovels, hauling trucks, graders, dozers and miscellaneous other equipment, but no injuries. And one other important point: The slide isn&apos;t the biggest ever, or even Utah&apos;s biggest if you are counting volcanic and prehistoric landslides. For one, the 1980 Mount St. Helens eruption in Washington released around 4.8 billion cubic yards of debris. That makes it around 50 times larger than the Bingham Canyon rock avalanche. "There are also many large events in the geological record indicating prehistoric landslides that outsized this one," Moore noted, pointing to the Sentinel slide that blocked Zion canyon and might have been as much as six times larger. 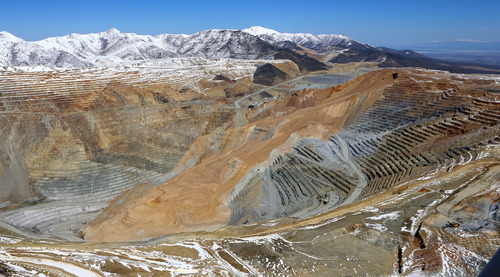 Kennecott spokesman Kyle Bennett said Wednesday the company is sticking by its early estimate that 165 million tons sloughed into the pit last month. But he declined to affirm Moore&apos;s ranking. "I&apos;m confident enough that I can say without a doubt that it is the largest one in Kennecott history," he said, adding that it is probably one of the biggest slides in the mining world, too. Lynn Highland, a geographer and coordinator for the U.S. Geological Survey&apos;s Geologic Hazards Science Center in Colorado, has looked over Moore&apos;s estimates and concluded the Bingham Canyon slide is probably the biggest man-made one she&apos;s ever heard of. "There&apos;s no doubt it was a big one," she said, echoing Moore&apos;s cautions about lumping it together with volcanic and prehistoric slides that no one was around to measure. 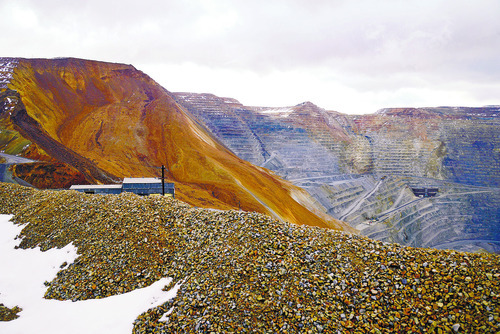 Highland noted that scientists and engineers will probably want to study Kennecott&apos;s slide even though their access to it will probably be limited because it happened on private property and was measured by a private company&apos;s monitors. Already, she&apos;s heard from other mine operators who want to know how they can forecast big slides in their own pits. "As a federal agency," she said, "we usually don&apos;t come in unless we&apos;re asked or invited because it is private property." Even though he hasn&apos;t been invited into the pit to study it, Moore can&apos;t help but be fascinated by the big landslide. Besides finding its place in landslide history, he&apos;s already developed a few more surprising guesstimates. Moore&apos;s back-of-the-envelope calculation: Around 165 tons moved at more than 120 mph, even up to 200 mph. That&apos;s the speed of a Formula One race car. For comparative purposes, consider that relocating the Atlas tailings pile outside of Moab, which is one-tenth the size of the Bingham Canyon landslide, will take 30 years. And more sobering, the Bingham Canyon slide is not just bigger than the 1983 Thistle slide, which Moore and Highland described as the costliest on record. Kennecott&apos;s April landslide probably will have a higher price-tag, Moore predicts, when the cost of the mine slowdown, the cleanup and jobs lost are tallied.